Winter Sleep (Turkish: Kış Uykusu) is a 2014 Turkish drama film directed by Nuri Bilge Ceylan, adapted from the short story, "The Wife", by Anton Chekhov. and one subplot of The Brothers Karamazov by Fyodor Dostoyevsky. The story is set in Anatolia and examines the significant divide between the rich and poor as well as the powerful and powerless in Turkey. At the 2014 Cannes Film Festival, the film won the Palme d'Or and the FIPRESCI Prize. The film was selected as the Turkish entry for the Best Foreign Language Film at the 87th Academy Awards, but was not nominated. One day, Aydın and his assistant Hidayet are driving down to the village when a stone shatters the window. It was thrown by İlyas, the son of İsmail, one of Aydın's tenants who is several months behind in the rent. When Hidayet confronts the father, it turns out that Aydın's people had already sent a collection agency that took İsmail's television and refrigerator, with İsmail getting beaten up by the police for resisting. The situation escalates until İsmail’s brother Hamdi intervenes. The film ends as Aydın returns home the next day. As Nihal stares out of the window, silently, Aydin's voice is heard explaining that he cannot live without Nihal, even if she does not love him anymore. Ayberk Pekcan as Hidayet, Aydın's assistant. Tamer Levent as Suavi, Aydın's friend. Mehmet Ali Nuroğlu as Timur, one of the hotel guests. The film was produced through the director's company NBC Film in collaboration with Turkey's Zeynofilm, Germany's Bredok Film Production and France’s Memento Films. It received 450,000 euro from Eurimages. Filming took place during two winter months in Cappadocia followed by four weeks in Istanbul for studio scenes. The film was shot with the Sony F65 camera. Winter Sleep has received universal acclaim. On Rotten Tomatoes, the film has a "certified fresh" rating of 89%, based on 71 reviews, with an average rating of 8.3/10. The site's critical consensus reads, "Epic in length, thrilling to behold, and utterly absorbing, Winter Sleep demands – and rewards – viewers' patient attention." On Metacritic, the film has a score of 88 out of 100, based on 27 critics, indicating "universal acclaim". Indie Wire praised the film and defined it as a "mesmerizing, superbly acted portrait of a wealthy, self-involved landowner and the various figures impacted by his reign" while The Telegraph called it a "bold, beautiful - and very long - film about a failing marriage" The Guardian also gave the film a glowing review describing it as a harsh "character study" and a "stunning picture" while praising Haluk Bilginer's "magnificent performance." Another positive review came from Variety. Film critic Justin Chang called the film a "richly engrossing experience" and asserted that Nuri Bilge Ceylan is at his "peak" with Winter Sleep. Another critic, Ben Kenigsberg, noting Winter Sleep was the longest film in the Cannes film competition, pointed out that the film was an awards favorite from the get-go. He also found "the movie's slow revelation of character detail quietly devastating." More positive reviews followed. Huffington Post reviewer Karin Badt called the film a "masterpiece" and noted that there is "movement and growth and self-realization" in the characters and none of them are "black-and-white." Also, the ending of the film was defined as "ambiguous" leaving parts of the movie to the interpretation of the viewer. Way Too Indie awarded the film 9.7 points out of 10, commenting: "What Bela Tarr did with images, Nuri Bilge Ceylan accomplishes with dialogue; one hundred percent inclusive assimilation. You literally get lost inside this world that seems to balance on the periphery of humanity itself. But, believe it or not, that’s just the surface. If you put your trust in Ceylan and his troupe of brilliant actors, every action will reveal deeper meanings, every frame will contain significant details, and you will leave the theater completely nourished." TIME Magazine remarked that it was no surprise that Winter Sleep won the award and noted: "Winter Sleep probes the psychology of a Turkish landowner confronting crises from his young wife, his sister and his aggrieved tenants." Irish Times called the film "terrific" and commented: "So leisurely is Winter Sleep, it makes Once Upon a Time in Anatolia, his last film, feel like an episode of The A-Team." 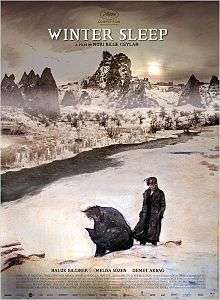 Cine Vue noted that while Ceylan's previous film Once upon a Time in Anatolia might have been inspired by Dostoevsky, Winter Sleep took its inspiration from Chekhov. The reviewer added: "The pacing of Ceylan's latest will inevitably be a hurdle for many viewers, as a slow-burn beginning with numerous scenes of dialogue played out in full gets even more unhurried in a pair of marathon confrontations." When the snow season approaches and the guests depart, the tension between Aydın, his wife, his sister who lives with him, and the village people takes over by long dialogues. Conversations dominate the film as the inner workings of the characters are slowly revealed. Variety reviewer Justin Chang notes that the argument between Hidayet and İsmail in the beginning of the film all happens "while Aydın keeps a timid distance [and this is] just a minor example of his complacency and casual indifference to the suffering around him." Aydın's comfort is, however, "challenged by the conversations that ensue between him and the poor family, his wife and his sister on topics ranging from civic responsibility to evil." The film won the Palme d'Or at the 67th Cannes Film Festival. The longest film in competition by far, Winter Sleep's Palme d'Or marked the culmination of the career of Nuri Bilge Ceylan, who has twice received the festival's second-place honor, the Grand Prix (for 2002's Uzak and for 2011's Once Upon a Time in Anatolia) and who won a directing prize for 2008's Three Monkeys. Ceylan said in his acceptance speech that it was "a great surprise" when he took the stage, noting that it was perhaps a fitting choice in a year that marked the 100th anniversary of Turkish cinema. Tacitly acknowledging the 2013–14 protests in Turkey that led to the deaths of 11 people, the director said, "I want to dedicate the prize to all the young people of Turkey, including those who lost their lives". He also mentioned the workers who were killed in the Soma mine disaster, which occurred on the day prior to the commencement of the awards event. Although it divided critics and audiences with its reams of dialogue and challenging 196-minute running time, the film became an early critics’ favorite and Palme d'Or contender when it screened on the festival’s third day. ↑ "Winter Sleep (2014) – Company credits – IMDb". Retrieved 26 May 2014. ↑ "New Wave Films Acquire Nuri Bilge Ceylan's Winter Sleep". 20 May 2014. Retrieved 29 May 2014. ↑ "Adopt Films Picks Up U.S. Rights for Palme d'Or Winner 'Winter Sleep'". 6 June 2014. Retrieved 6 September 2014. ↑ "Turkey's harrowing 'Winter Sleep' takes top prize at Cannes". Reuters. 24 May 2014. ↑ "Festival Reports – Cannes Film Festival 2014". FIPRESCI. Retrieved 23 May 2014. ↑ "Turkey submits Cannes winner Winter Sleep for Foreign Language Oscar". Screen Daily. Retrieved 11 August 2014. ↑ Staff writer (20 March 2013). "Eurimages distributes 3.6M € to 13 coproductions". Cineuropa. Retrieved 10 March 2014. ↑ "Director Nuri Bilge Ceylan's F65 shoot". sony.co.uk. Sony. Retrieved 10 March 2014. ↑ "Cannes 2014: Winter Sleep review – unafraid to tackle classic Bergman themes". The Guardian. Retrieved 24 April 2014. ↑ "Winter Sleep, winner of the Cannes Palme d'Or – review". The Telegraph. Retrieved 24 April 2014. ↑ "Indie Wire - Winter Sleep review". ↑ "The Telegraph - Winter Sleep review". ↑ "The Guardian - Winter Sleep review". ↑ "Variety - Winter Sleep review". ↑ "RogerEbert.com - Winter Sleep review". ↑ "Huffingtom Post - Winter Sleep review". ↑ "Way Too Indie - Winter Sleep review". ↑ "TIME Magazine - Winter Sleep review". ↑ "Irish Times - Winter Sleep review". ↑ "Cine Vue - Winter Sleep review". 1 2 Robbie Collin (24 May 2014). "Winter Sleep, winner of the Cannes Palme d'Or – review". The Telegraph. Retrieved 25 March 2014. 1 2 Justin Chang (16 May 2014). "Cannes Film Review: 'Winter Sleep'". Variety. ↑ Karin Badt (24 May 2014). "Nuri Bilge Ceylan's "Winter Sleep" Wins Palme d'Or at Cannes: A Masterpiece". The Huffington Post. ↑ "Cannes 2014: Winter Sleep wins Palme d'Or". BBC News. Retrieved 25 May 2014. ↑ Ben Kenigsberg (24 May 2014). "Nuri Bilge Ceylan's "Winter Sleep" takes Palme d'Or". Roger Ebert.com. 1 2 3 Justin Chang (24 May 2014). "Cannes: 'Winter Sleep' Wins Palme d'Or". Variety. ↑ "Turkish Film 'Winter Sleep' Wins Top Honor at Cannes". New York Times. Retrieved 25 May 2014. ↑ "Cannes: 'Winter Sleep' Wins the Palme d'Or". Hollywood Reporter. Retrieved 25 May 2014.